We don’t really know the reason behind (although there are many plausible theories), it seems as though the attainment of balance is vital in every aspect of our lives. Our chakra systems help us to achieve balance through the distribution of energy that vibrates on seven different levels. When we are out of balance, our chakras will be out of balance and vice versa. Chakra Readings and chakra work is a fine way to rebalance ourselves, find out what aspects of your ‘self’ might be unbalanced, how that affects your life and health, and to support personal growth. Find out more about chakras, chakra readings and why you might benefit from working with your chakras today right here. Want a Live Chakra Reading? 1 Want a Live Chakra Reading? 2 What is a Chakra Reading? 3 Why Are Chakra Readings Beneficial To You? 7 Who is a Chakra Reading For? What is a Chakra Reading? A Chakra reading is a spiritual or psychic reading with a difference. It focuses on the balance and alignment of your chakras and how your chakras influence your everyday life instead of reading the general energy around you and how that influences you. A Chakra is almost like the management centre for the energy that flows through your body, and so when you work on your chakras you are ensuring that the right energy is flowing through your chakras and that it is clean, ensuring a healthy and balanced flow of energy which equates to a healthy and balanced body, mind and spirit. Chakra work can be an excellent way to heal aspects of yourself without needing to understand consciously why you might have developed a problem which is perfect for those who don’t revel in personal development. And the beauty of chakra work is that you can get a chakra reading online right now! Why Are Chakra Readings Beneficial To You? Chakra readings are hugely beneficial to you because they can help you to become aware of the energy that is blocked, diluted or ‘polluted’. Your Chakra Advisor or Chakra Psychic can either heal the energy or teach you how to clear the energy yourself. Which means that they can heal any blockages and imbalances. And prevent you from becoming imbalanced or unhealthy in your everyday experience of life! Whether a blockage might be manifesting in your sense of self, and primary living experiences, your emotional self, your general energy, your sense of love, compassion and romantic relationships to how you communicate, think, perceive the world and grow as a person and a soul. The effects of chakra work are profound and incredibly beneficial. The first step to finding out how to understand the health of your chakras is by speaking to a chakra advisor or chakra psychic. There are plenty of options to finding a chakra reading online and biased as we may be, we think that everybody would benefit from a routine chakra reading online every now and again to attain optimum health and wellbeing. Chakras, to give them their broadest explanation, are energy vortexes within our psyche, that move and direct energy around us so that we can live optimally. They affect every aspect of our lives and psyche, and since energy is the spirit of life, it’s crucial for our health and wellbeing that we find a way to keep our chakras crystal clear so that we can live optimally. Otherwise, at least in my opinion, it could be like cleaning your whole house with a toothbrush which is not very practical! The seven chakras represent seven major aspects of life, and also have their own colour vibration. Here’s a quick breakdown of each chakra and what they represent. Represents: Personal power, will, mental activities and is also where we radiate out our energy, and process how we feel about our experiences in life. Represents Self-expression, creative expression, communication. Represents Spiritual connection, oneness, consciousness. A professional chakra reading is the best way to enjoy a chakra reading because your chakra advisor or chakra psychic will be experienced at helping you understand how to heal any blockages and give you the right advice for what you can do to balance out your chakras. Step 1: Sit quietly in a place where you will be undisturbed and comfortable. Making sure you will be warm enough and not so comfortable that you might fall asleep! Step 2: Imagine all seven of your chakras as though they are big glass balls standing on top of each other in the correct order of your chakras, and making sure that each one is the right colour for that chakra position. Step 3: Assess the status of your visualisation of the glass balls that represent the chakras, are they all the same size, or are some larger than others? Are the colours vivid and vibrant, or pale, murky, dirty, or even black or grey? Step 4: The distortions in your chakras represent blockages, and imbalances in energy or pollution and the aim is to have all of the glass balls representing your chakras be the same size, and their representative colours to be bright, clear and vivid. If they are not (which if you’ve never read or cleared your chakras is likely), you can use a creative visualisation technique to ‘clean and repair your chakras so that they are balanced and sparkling. How To Interpret Your Visualisation. Balls that are much larger, or much smaller represent that you are using too much, or too little of a specific energy. For example; if your Sacral Chakra and Throat Chakra are much larger than the others, then you might find yourself overly emotional, and involved in too many arguments because you are communicating your emotions too much also. If your root chakra is tiny at the same time, you might not be finding it easy to meet your basic needs or struggle to find a zest for life. If the colours are faded the potency of the energy coming through is filtered, perhaps by too much daydreaming, a sense of ungroundedness, unconsciously rejecting the associated energy and living too much in a fantasy or spiritual world. If the colours are murky, there’s lots of ‘dirt’ that you’ve accumulated which needs to be cleaned. If a ball is too dark, or too white, you either haven’t got enough potency coming through at all or if its dark, you’ve accumulated too much ‘dirt’ or have experienced trauma. Trauma can also be represented in dark specks in your glass balls. Clearing your chakras might take a dedicated and daily practice for a while because we often repress emotion and memories that we cannot handle. As you clear your chakras, they will fill up with any residual dirt that you might have suppressed, depending on your experiences in life, you might have to have a few intense clearing sessions before that slows down but when it does – it won’t come back, especially if you keep up a regular chakra cleansing routine. You’ll notice if you have any residual ‘dirt’ if you check your chakras the next day, or a few days later, and they look imbalanced and dirty again. Step 2: Choose a chakra to clean. 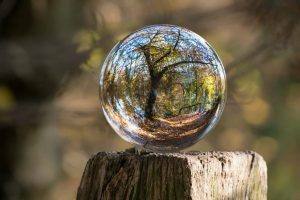 Imagine that you have a hosepipe (or preferably a powerwash) and imagine cleaning the dirt and debris out of the glass ball. As you do this, you might find that there are some stubborn parts that you can’t clean quickly, and also that you might become irritated, frustrated, even emotional as you are hosing the debris out. This is all part of the process. Step 3: Check that you are happy with how clean the is and then repeat this step for all other balls. Note: This step will take some time at first and may take a few sessions to complete. Step 4: When you are happy that you’ve cleared out the debris from your chakras and that they are all clean, the next step is to try to balance out the balls by visualising them to be the same size and are all big and solid. Step 5: Check the colours, are they vibrant now, or still washed out or dark? If they are dark you have more cleaning to do; if they are washed out, you need to imagine the colour and energy that the colour represents pouring into the ball and filling it up to the brim. This might make you feel something physically, but it will probably be a pleasant sensation. Make sure the colour stays bright. Step 6: Double check to see if you are happy with the size, shape, colour and cleanliness of each chakra, make any necessary adjustments, and repeat daily until they start to stay the same for more than one day. Step 7: Set up a regular chakra cleaning routine, and check in with a Chakra Psychic regularly to make sure that you haven’t missed anything and then enjoy the results that are sure to occur in your ‘new’ clean and vibrant life. Who is a Chakra Reading For? A chakra reading can benefit every adult. Not least because it’s a great way to nip potential problems in the bud before they can develop and manifest in your life. The best way to use a chakra reading is to schedule one in for each month, quarter, or six months so that you can find out what you need to do to cleanse and clear up your chakras. You can expect to be enlightened from your chakra reading first and foremost. You will learn about how your energy might have become blocked, what chakras are blocked and how to clear them up. Some chakra advisors may also help you heal the chakras or provide you with advice on what you can do to make your chakras shine! Here are our picks: Click the links and follow the instructions to book your reading now. Find out how you can live a balanced life. Focus on things in your psyche that are important and need to address. A refreshing, balancing and very insightful reading. Find practical steps to achieve health in all aspects of your psyche. There are not as many chakra psychics as regular psychics. Are you ready to take the plunge and try out your first chakra reading online?